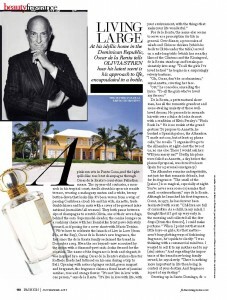 At his idyllic home in the Dominican Republic, Oscar de la Renta tells OLIVIA STREN how his latest scent is his approach to life, encapsulated in a bottle. 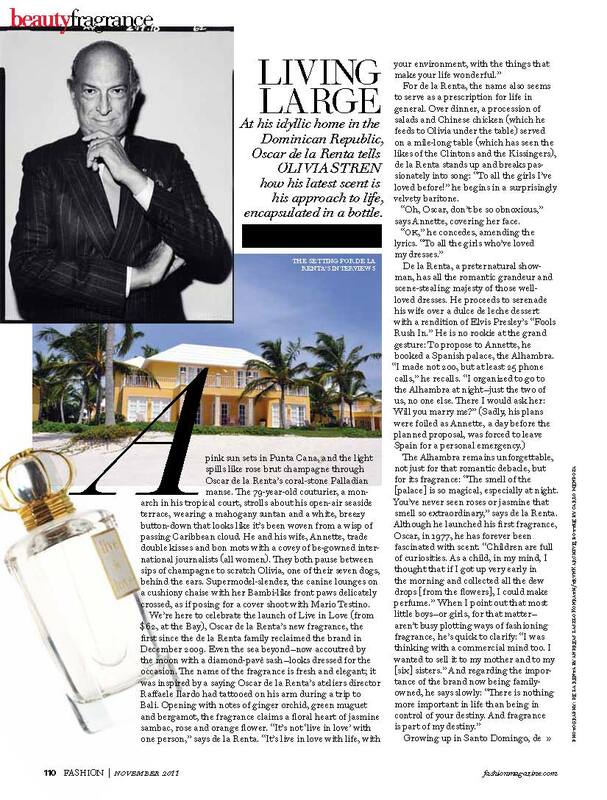 A pink sun sets in Punta Cana, and the light spills like rose brut champagne through Oscar de la Renta’s coral-stone Palladian manse. The 79-year-old couturier, a monarch in his tropical court, strolls about his open-air seaside terrace, wearing a mahogany suntan and a white, breezy button-down that looks like it’s been woven from a wisp of passing Caribbean cloud. He and his wife, Annette, trade double kisses and bon mots with a covey of be-gowned international journalists (all women). They both pause between sips of champagne to scratch Olivia, one of their seven dogs, behind the ears. Supermodel-slender, the canine lounges on a cushiony chaise with her Bambi-like front paws delicately crossed, as if posing for a cover shoot with Mario Testino. For de la Renta, the name also seems to serve as a prescription for life in general. Over dinner, a procession of salads and Chinese chicken (which he feeds to Olivia under the table) served on a mile-long table (which has seen the likes of the Clintons and the Kissingers), de la Renta stands up and breaks passionately into song: “To all the girls I’ve loved before!” he begins in a surprisingly velvety baritone. “Oh, Oscar, don’t be so obnoxious,” says Annette, covering her face. he couple owns 20,000 acres of land, 20 kilometres of private river and the former home of the Marquess of Lorne, one of the first Governors General of Canada and husband to Queen Victoria’s daughter, Princess Louise.) He also talks about the colour of love itself: “People think of love as pink or red, but love has much more to do with green.” Following that logic, his gardens are a sea of love: mapped with orchid nurseries, bird of paradise flowers, spouting fountains, towering succulents and groves of prickly pear, grapefruit and starfruit trees—all in ever-shifting shades of green, ranging from apple to emerald to kelly. During a post-lunch tour of the garden with de la Renta (which feels vaguely like getting a tour of Eden by God himself), he picks a bay leaf. “Smell is the longest remembered of all the senses,” he says. As we say our farewells in the foyer, I hear the designer proclaim, “Oh, Olivia, you are lovely! What a beauty!” Startled, I turn around. The scent of embarrassment is also memorable. He was talking to his dog.